LOUDOUN COUNTY, VA.— It could very well be as close to the perfect place to live as 520 sq. miles of picturesque towns and beautiful countryside could be. The geography alone, with its spectacular mountain ranges – the Catoctin and Bull Run with the Blue Ridge Mountains as a backdrop – is enough in and of itself to set Loudoun County apart from any other close-in Washington metro area County. Loudoun County is pretty much the vineyard and tasting room capital of the region with 37 wineries dotting the rolling landscape. And soon the county will be within a metro subway ride of another Capitol, the nation’s. As for the residents, Loudoun County is populated by a vibrant mix of young and old, but dominated by young families with a median age of only 35.2 years. Median household incomes here, ranked #1 nationally in 2013 for jurisdictions with a population over 65,000. And a higher percentage of Loudoun County residents attained Bachelor’s degrees than all but nine other jurisdictions in the entire country (also with populations over 65,000). No wonder it is the second fastest growing county (with populations of 100,000 or more) in the United States. Visit Loudoun County. 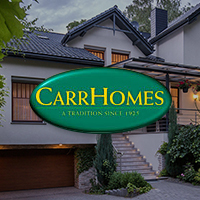 You’ll see why CarrHomes is so proud to have two new single family home communities, Waterford Creek and Loudoun Oaks, taking shape here.